YouTube: Gina Rinehart’s video message regarding Kidman sale. Treasurer Scott Morrison has approved the sale of the Kidman cattle empire to mining magnate Gina Rinehart and a Chinese company. “I have decided that the acquisition of Kidman as proposed would not be contrary to the national interest and will be permitted to proceed,” he said in a statement. It is the third attempt by Chinese interests to buy into Australia’s largest private landholder. Mrs Rinehart’s Hancock Prospecting will own 67 per cent of S Kidman and Co with partner Shanghai CRED taking a one-third minority stake through their joint-venture company Australian Outback Beef (AOB). The sale will not include the defence-sensitive Anna Creek Station or The Peake which will be sold to a local South Australian grazier family. The 117-year-old family company, founded by Sir Sidney Kidman, has pastoral leases covering 101,000 square kilometres across Western Australia, the Northern Territory, Queensland and South Australia. It runs a herd of up to 185,000 cattle, producing grass-fed beef for export to Japan, the US and South-East Asia. In a video released by Hancock Prospecting following the approval, Mrs Rinehart said she had long wanted to diversify. “Right now all our eggs are in the iron ore basket,” she said. “Now to become the third largest producer of cattle in Australia I think it’s just great. “I see an ongoing need for meat particularly in the Asina region and most of our cattle from Australia, three quarters, we export. “Then we will be investing additional capital of $19 million to further … grow the business and take the herd size to well over 200,000 and potentially far beyond that if we are able to identify sensible acquisitions to add to the business,” he said. “We will create over the next three to five years an additional 100 jobs in regional Australia. Mr Korte said having a Chinese partner to gain access to additional export markets is “absolutely critical if there’s to be any credible plan to expand and grow the business”. The announcement ends an often fraught, 20-month sale process which attracted interest from 600 parties and included an attempt to crowd-fund an Australian bid. 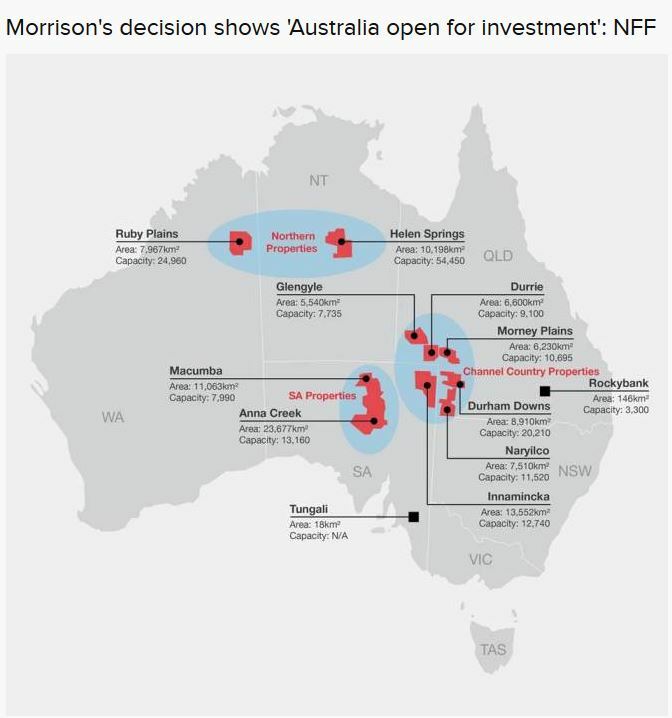 Mr Morrison blocked an initial all-Chinese offer by Shanghai Pengxin in November 2015 on the grounds that foreign ownership was not in the national interest given the size and defence sensitivity of the Kidman landholding. Posted on December 10, 2016, in ConspiracyOz Posts. Bookmark the permalink. 1 Comment.